Have you ever wondered why "banana" flavored candy doesn't taste anything like actual bananas? Like, it has a flavor that's identifiable as "banana candy," but isn't really anything like what you would consider a banana to realistically taste like? It's because that artificial flavor is based on a variety of banana that's all but extinct. The crop was hit with a devastating fungus (think "potato famine," but with bananas) and producers switched to a different variety, the one we eat today. So banana candy flavoring might give your grandparents flashbacks, but for us, it's as natural and realistic as grape-flavored cough syrup. 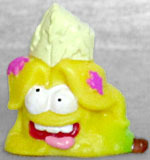 Squished Banana is the most unappeeling dude you'll meet! Some days he's a romantic fool, some days he's a rotten fruit. You never know because of his SPLIT personality! This guy can't wait to get his slimey slippery hands on the Clean Team and put a few bends into them so he can impress the Grossery of his dreams! Get ready to fight dirty! Okay, if the total lack of understanding regarding basic pronunciation that was displayed in Grub Sub's bio wasn't enough to clue you in that these toys are made by an Aussie company, then this one really should! I mean, come on: they worked in a "banana benders" joke, which no one outside of Australia would even spot, let alone understand! Might as well throw out a casual reference to Shaun Micallef while you're at it! 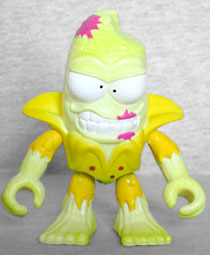 After a brief wait, the second wave of Grossery Gang: Putrid Power figures has begun to hit shelves. The three new figures are mixed in with a few rereleases from the first wave, because apparently Moose Toys studided at the Hasbro school of frustrating decisions. In any case, these new figures continue the trend of including a small rubbery version of the featured character. Squished Banana made his debut in Series 2 of the PVCs, but this is an entirely different look for him - for one thing, he's now reclining on his side, like Jabba the Hutt, rather than standing and facing the front. The render on the back of the packaging shows a lot more paint apps, but those didn't make the cut. 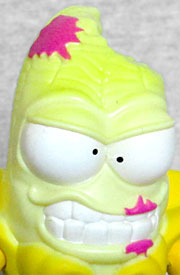 The official art of Squished Banana has always shown him with a bite out of him, but neither the existing figurines nor the web animation have ever shared that feature. 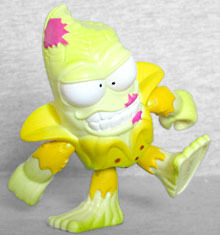 "Putrid Power" Squished Banana does, with a big chomp missing from the left side of his head. The little ones have also always had his face on the outside of the peel, while the powered-up version has it on the fruit within. He has a sinister sneer on his face, though it's possible that wavy upper lip is actually supposed to be his mustache - the cartoon casts him as a Latin lover type, for some reason, even going so far as to name him "Ricardo." Ricardo? Why Ricardo? That deprecated banana variety we mentioned at the top of the review? It was called the "Gros Michel," so why don't they call this guy Gross Michael? That's on-brand and deeply clever! Squished Banana's body is, as you'd assume, a banana. A banana that has arms and legs sprouting from its sides, somehow. The sculpt on the "meat" part of the figure has grooves and wrinkles just like the real fruit, while the peel is smoother. It's weird that they jammed five toes onto each of his feet, when he only has four fingers, but the splotches of whatever that are splatted on his body are molded elements. The paint could be better, however. Oh, it's applied well enough (except the areas on his back that were skipped for budget reasons, of course); the problem is the design of it. The peel and the banana are different shades of yellow, but not that different, y'dig? This is supposed to be a grody old nanner, yeah? So why isn't his peel all black and spotty, like happens to the real things? Why are the purple spots on him sculpted like separate goo, rather than just being normal banana bruises? It's a missed opportunity. Another missed opportunity? The articulation. 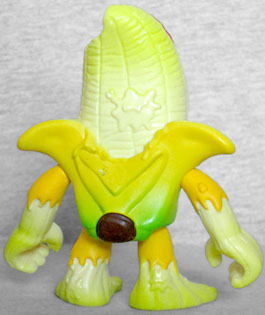 Squished Banana has the same swivel/hinges at the elbows and hips that everyone else has, but he's missing the balljointed head - since the head and body are basically one solid shape, the toy doesn't bother making them separate. Come on, Moose! This would have been so logical to do! Bananas can be broken apart at any point along their length, so why not have the head be a removable piece that sits down inside the peel slightly? All three of the new figures in this half of the series have this same flaw. And that means you can't put the tiny rubber fig on the big one's neck for extra fun! Boo! 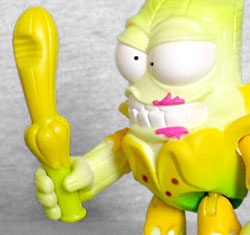 Like the other action figures, Squished Banana comes with a weapon. His is... well, it's probably supposed to look like the sort of club policemen carried in old-timey cartoons, but instead it looks like a banana-themed marital aid. The handle is pale green, while the banana and peel are the same shade of yellow. None of which keeps it from looking like it's more for pounding someone's insides than pounding someone's outsides. And I can't believe I'm going to say this, but the tip is so thick it can't fit into the standard-sized hole, so that particular play feature is gone, too. When the Gros Michel banana was no longer commercially viable (ie, the 1950s), it was replaced by the Cavendish banana, which not only had a different flavor, it wasn't even the same shape! It'd be like if you suddenly all "oh snap, fam, I'm out of broccoli!" and someone handed you some kale to take its place - yes, they're both cultivars of wild mustard, but they're hardly interchangeable. Anyway, Cavendishes account for 95% of all bananas sold worldwide today, and guess what: there's a fungus that's starting to decimate them, just like the bananas of yore. Yay. And we don't have any specific replacement banana ready to slot in there. Double yay. (There are other varieties around, but the ones that taste good enough to bother with don't ship well enough to be affordable.) The point is, someday your grandkids may not even recognize what Squished Banana is supposed to be. And they'll really have some questions about his accessory.